Can The Archiving Feature in GroupWise Be Disabled From Vertigo? I implementing 3rd party archiving software, and I want to disable the archiving feature in GroupWise for all users, is there a way to do this in Vertigo? 1) Disable auto-archiving in single-user mode. 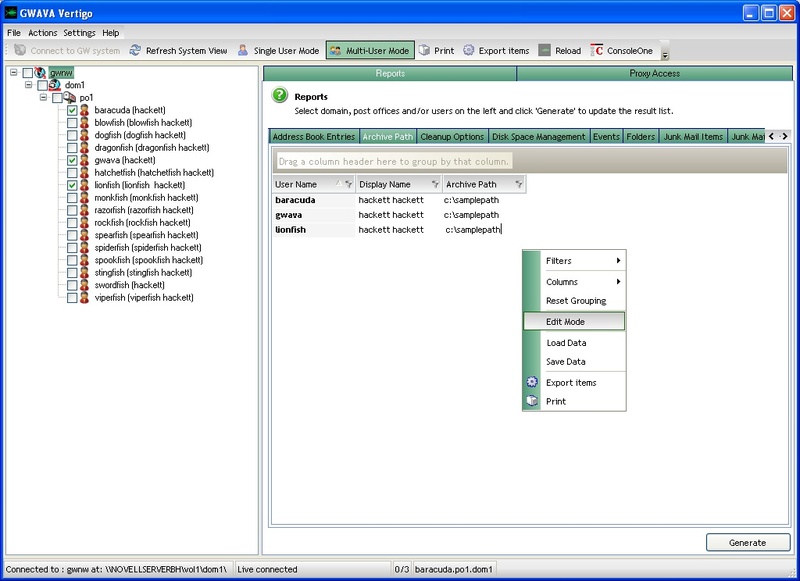 After having connected to the GroupWise system, select 'Single User Mode' from the toolbar, then select a user for which to change the archiving feature. Next, select the 'Environment' tab, then the 'Cleanup' sub-tab. To disable the auto-archiving feature, select the radio buttons, where it says "Manual delete and archive" next to it. Then click on 'Apply'. Continue to do this for each user, or for whichever users need this feature disabled. 2) Remove the archive path in multi-user mode. Select 'Multi User Mode' and then select the users in the left column that are getting the archiving feature disabled. Next, under the 'Reports' tab, select the 'Archive Path' sub-tab, then towards the bottom, select 'Generate'. This will build the list of all the selected users, and show their name and archive path. Now, right-click somewhere inside the generated report, and select 'Edit Mode'. Left-click inside the "Archive Path" field for any user, and then use the backspace or delete keys to remove the archive path. Repeat this step for each user. After this process is finished, right-click again, and de-select 'Edit Mode' and the changes should be saved. This article was originally published in the GWAVA knowledgebase as article ID 1886.